Republican Senator Lindsey Graham argues Israel could have gotten a better security aid package had it waited until after Obama left office. Republican Senator Lindsey Graham (R-SC), who oversees the U.S. foreign aid budget, opined on Friday that Israel made a mistake by signing a new $38 billion security agreement with the Obama administration, The Associated Press reported. 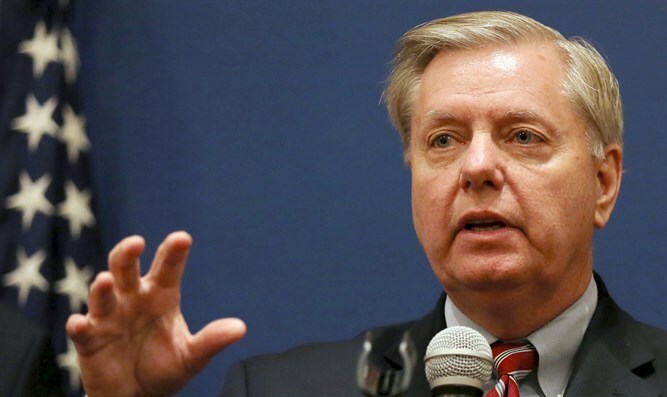 Graham said Israeli Prime Minister Binyamin Netanyahu could have gotten a better deal if he had waited until President Barack Obama left office. He stated that there is ample support in Congress among Republicans and Democrats for providing Israel with more military aid. And a new U.S. president, either Hillary Clinton or Donald Trump, would be more generous too, he said on a conference call arranged by the Jewish Institute for National Security Affairs. "They left money on the table," Graham said of Israel, according to AP. The security agreement, which begins in the 2019 budget year, is set to last 10 years and amounts to $3.8 billion annually. The current deal expires in 2018 and gave Israel $3.1 billion in military assistance each year. Graham, who chairs a Senate Appropriations subcommittee, said Congress isn't a party to the agreement and shouldn't be bound by the deal, adding that he intended to test in the coming weeks a provision that restricts lawmakers from providing for more money than the deal mandates by pushing for a supplemental budget that would give Israel an additional $1.5 billion over what the administration has proposed. The Obama administration is trying to "neuter" Congress but undercutting its ability to appropriate money, according to Graham. "I will not stand for that," he stressed in the comments quoted by AP. Graham’s comments follow reports earlier this week that he was responsible for the delay in signing the memorandum of understanding (MOU) concerning the security aid to Israel, due to the fact that he believed Israel deserved more funding. Graham has been a staunch supporter of Israel and last year promised to respond with a “violent pushback” if the United Nations attempts to force a resolution to the conflict with the Palestinian Authority on Israel. Meanwhile, Sen. Bob Corker (R-TN), the chairman of the Senate Foreign Relations Committee, seemed to side with Graham on his comments with regards to the MOU. Corker said in a statement Wednesday that the agreement "sends an important signal about our long-term commitment to Israel," but the amount of money "is ultimately up to Congress to decide." Graham said lawmakers this year wanted to give Israel $600 million for missile defense — $100 million more than the agreement proposes to provide in 2019 when the threats Israel is facing from Iran and extremists groups are expected to be even more pronounced. Graham said he also pushed for a $300 million hike in the foreign military financing account. Iran will view the new agreement as a "watering down" of the U.S. commitment to Israel, said Graham, according to AP.